This beautiful 1800 sq ft villa has four bedrooms all with in suite bathrooms and is equipped with all the comforts of home but comes with the convenience of being situated less than two miles from Disney World. Private pool and spa! This beautiful 1800 sq ft villa has four bedrooms all with in suite bathrooms and is equipped with all the comforts of home but comes with the convenience of being situated less than two miles from Disney World. 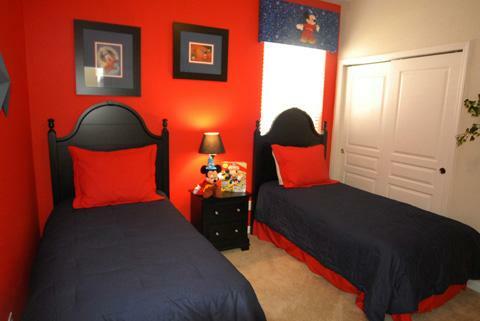 Fully furnished luxury family vacation home located in Windsor Hills Resort, which is approximately 2 miles from Disney World and minutes from all the other Orlando Area Attractions. 4 Bedrooms each with an in suite bathroom, with 2 King Sized Beds with Soft Pillow Top Mattresses, (2) 2 Twin Themed rooms plus 4 Flat Screen LCD HD TV's all with DVD Players in all 4 bedrooms! GE Quality Kitchen Appliances including Microwave, Fridge with Ice Maker, Glass Top Range, Dishwasher, Food Disposal Unit, and GE Large Capacity Washer and Dryer. The kitchen is fully equipped with all the utensils and dinner ware you may need. WIFI throughout the entire home, IPOD Dock, Dell Desktop with high-speed internet and free phone calls to US and Canada. Plus a games room comes complete with 7 ft Pool Table, Air Hockey, Little Ones Play Area and Basketball Arcade Chute. The pool area is wonderful with a 14' x 28" Heated Pool with pavers, lights and screened bug free lanai enclosure, pool toys, outdoor dining tables and chairs with lounge chairs. The heated jet spa is connected to pool! Plus a childproof safety fence to keep the little ones safe/ There is an additional 400 square feet in your private outdoor pool and lanai area. 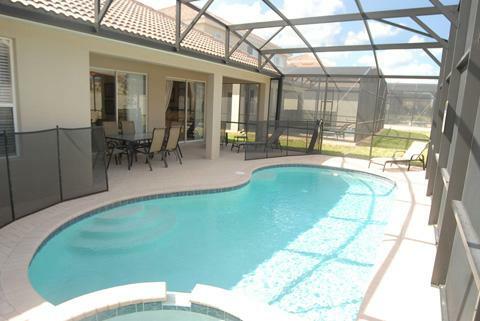 This is a wonderful home for your next Florida vacation.